Ktoś się interesuje tą grą? Zbiera jakieś mocne noty i podobno to prawie Metroid 2D. 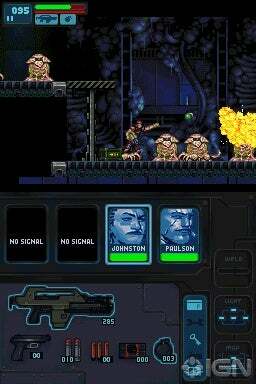 Aliens Infestation is a 2D sidescrolling action adventure that takes place in the month after the events of James Cameron's Aliens, but before Alien 3. A team of Fox-Six marines led by one Lieutenant Colonel Patrick Steele is sent to investigate a distress beacon from the lost war ship, the Sulaco. Over the course of the adventure you will control a total of 19 colonial marines as they attempt to get to the bottom of the distress signal, the manipulations by the mega-corporation Weyland-Yutani, the lethal lifeforms waiting in the shadows. Gameplay is a mix of run and gun and stealth but also peppered with vehicle sections, all weaved together in the familiar "Metroidvania" style of play. Now you know what you're in for marine, it's time to board that express elevator to hell, GOING DOWN! As it's developed by WayForward Technologies, you can expect brilliantly detailed 2D sprites for all 19 invidiual marines. Each one has their own unique look and personality which is expressed in things like taunts, victory celebrations, and even some awesome idle animations. All the portait art for each grunt was designed by famed Marvel Comics artist, Chris Bachalo. The Aliens themselves are nicely detailed; from eggs, facehuggers, chestbursters, drones, warriors, queens, and even a few new Alien designs to add to the fray. 4. A research facility on the planet Phobos. You progress through each area in a linear fashion, but each one has it's own large map that has blocked corridors, sealed-off vents, and locked blast doors that all need specific tools, skills and weapons to bypass. You control 4 marines in your squad at a time and whenever one of them gets wasted, you can use a back-up marine to fill that spot. You can also collect weapons like the smart gun, pulse rifle, flamethrower, and even apply multiple upgrades to each one. Reviews for Aliens Infestation have been pretty positive thus far. Critics have praised the amazing sprite work, tight gameplay, and tons of fan-service and well-written dialog that can be found during the campaign. Some of the negatives have been it's relatively short playing time, (around 5 hours) and that the audio component is a little on the ho-hum side, but that's more of a flaw of the Nintendo DS's sound capabilities than the game itself. The speakers of the Nintendo DS can hardly be matched up to the bombastic and memorable sound effects and music found within the films. Dobry, ładny, neogafowy oficjalny temat Ktoś tu na forum chyba tez próbował. W każdym razie, ciekawsza gra niż cokolwiek, co ma w zanadrzu 3DS. bez backtrackingu byłaby żenująca krótka, a i tak nie jest za długa. ale jak na handhelda akurat tak. Zacząłem grać i pierwsze wrażenie - walki z obcymi ciężko przejść bez draśnięcia, a szwędając się np. w poszukiwaniu itemów, upgradów etc. zawsze coś mi trochę życia uszczknie i w efekcie save room jest zbawienny, bo zazwyczaj docieram do niego na końcówce energii. Klimat przez to gra ma świetny, aliensowa otoczka z resztą już robi swoje. nie ma do wyboru poziomu trudnosci? nie ma niestety. Zawalili trochę, bo wraz z upgradami postaci nie pojawiają się nowe alieny stanowiące większe wyzwanie. Trochę podkręcić poziom trudności można sobie próbując robić on-team run, czyli nie ginąć żadnym żołnierzem, bossfighty są w miarę wymagające wtedy.